Renaissance Apprentice Program is a real-world hands-on learning environment sponsored by Renaissance Custom Furniture. 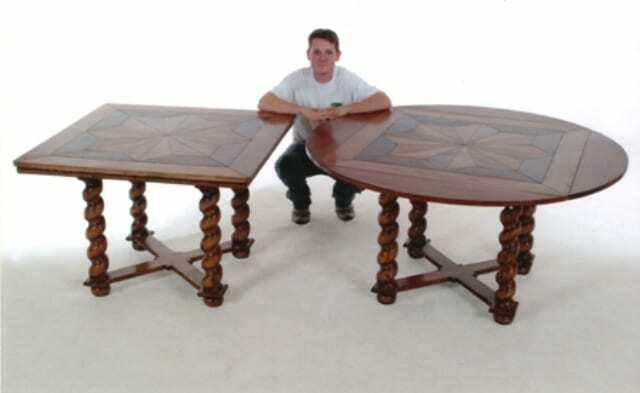 Renaissance Custom Furniture receives commissions to build furniture and you, the apprentice, help to complete the commission. In the process, you learn: a) to construct and finish furniture, b) the type of furniture clients are paying top dollar for, c) how to profit from your trade, and d) methods of dealing with clients that ensure a top-quality product that exactly meets the client’s expectations. Since our business niche tends toward designs that are historical in nature, you will benefit from learning the design aesthetic of the best of furniture from centuries past. This program is not designed for you to explore your own creative thoughts, rather, it is designed for you to learn from the creativity of others. Just as a painter would benefit from studying Rembrandt and Monet, you will benefit from projects inspired by Chippendale, Sheraton, and others. Then, you will be better equipped to explore your own creativity if you should desire. This is the strength of RAP. : solid teaching of design aesthetic and woodworking and a proven business model. There is no charge for the program, your labor pays your tuition. In return for your labor, you receive a solid, personalized, well-balanced educational experience. Whether you choose woodworking as a hobby or a profession, R.A.P. will prepare you for the world ahead. Located halfway between Dallas, TX and Shreveport, LA is rural Hawkins, TX, home of the Renaissance Apprenticeship Program, sponsored by the Renaissance Custom Furniture. This is a “hands-on” working environment where you can become a master woodworker. Individual instruction between apprentice and instructor is the foundation to this course. You do not have to be experienced in woodworking to become an apprentice. However, you absolutely must possess a great desire to learn the trade. You may choose to apprentice 40 hours a week for 12 months; 30 hours a week for 18 months; or 20 hours a week for 24 months. The shop is open from 7:30 am to 7 pm Monday to Saturday. Safe and capable students may be allowed to work after hours on personal projects in order to build their own portfolio. The workshop is outfitted with typical machine and hand tools. This program is based on the belief that tools do not build a piece of furniture—a craftsman does. Therefore, the emphasis is on honing a person’s skills to use basic equipment. Just as the artisans of the past, we do outstanding work with ordinary tools and extraordinary attention to detail. A variety of materials are used in our shop. Some of the usual hardwoods include maple, mahogany, cherry, alder, and walnut. We also use exotic burl and crotch veneers. These materials are employed in building chairs, entertainment centers, dining tables, and beds. Designs are usually historical, often incorporating contemporary elements as well. Most pieces crafted have either English or French Provincial influences, distressed to appear as antique furniture. You will work on pieces ordered from the company, which may be from our portfolio or a custom order. Occasionally, we reproduce antiques. There is a tremendous amount to learn to master the trade in such a short time. You will be taught to take sketches and pictures from clients and translate these into working drawings. You will be taught to develop good designs, striving to keep factors like quality, beauty, function, and economy working together. The finish on a piece of furniture is absolutely critical. One of the most important skills you will be taught is how to provide a beautiful, quality finish. In the design world, customizing the finish color is very important. Therefore, we will teach you to color match and topcoat using pre-catalyzed lacquer. Then you will be taught to hand-rub a finish. Other facets of furniture making you may be taught include decorative veneer layup, wood and brass inlays, and hand carving details such as acanthus leaves. You will also be introduced to the challenging aspects of running a small business. The aim of this program is that you will be able to take a project from its earliest stages of drawings and raw materials to delivering a finished product. • To be responsible for all your own expenses, including, but not limited to, room, board, medical and transportation cost. You are strongly advised to have medical insurance. • The following items: Safety glasses, hearing protection, respirator for organic vapors (found in auto body supply stores), and six sets of replacement cartridges and prefilters for respirator, tape measure. refunded if you fail to meet the terms outlined in this agreement. You may also be dismissed from the apprenticeship for such failure, resulting in loss of your deposit. If you are interested in applying for this apprenticeship, please send your resume, telephone number and your reasons for wanting to be accepted. An in-person interview is required of candidates. If selected to participate, you must sign and date this agreement and return it with your tuition. Apartment vacancies are rare, so plan ahead; you usually have to get on waiting lists. Feel free to call with any further questions. I have read the foregoing letter and understand and agree to its terms. By signing, I indicate my desire to become an apprentice in the Renaissance Apprenticeship Program. I understand I receive no wages or compensation. I understand furniture designs in the portfolio of Renaissance Custom Furniture shall remain the exclusive property of Renaissance Custom Furniture. Therefore, I agree never to market furniture designs that in any way pertain to the furniture designs contained in the Renaissance Custom Furniture portfolio. I also agree not to market to Business Contacts of Renaissance Custom Furniture.